I = iradon(R,theta) reconstructs the image I from projection data in R. theta describes the angles (in degrees) at which the projections were taken. You optionally can compute the inverse Radon transform using a GPU (requires Parallel Computing Toolbox™). 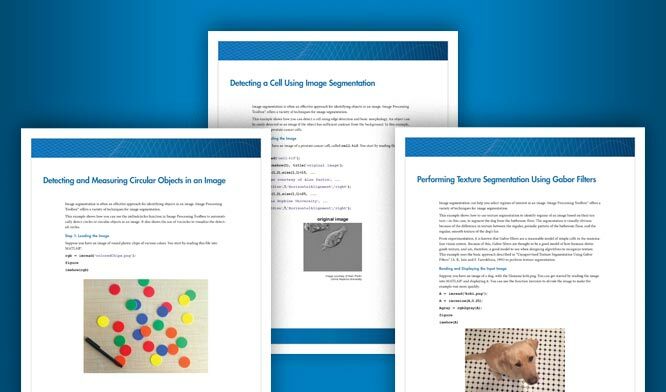 For more information, see Image Processing on a GPU. I = iradon(R,theta,interp,filter,frequency_scaling,output_size) specifies parameters to use in the inverse Radon transform. You can specify any combination of the last four arguments. iradon uses default values for arguments that you omit. [I,H] = iradon(___) also returns the frequency response of the filter, H.
Create an image of the phantom. Display the image. Perform a Radon transform of the image. Create an image of the phantom. Perform a Radon transform of the image, then get the projection vector corresponding to a projection at a 45 degree angle. Perform the inverse Radon transform of this single projection vector. The iradon syntax does not allow you to do this directly, because if theta is a scalar it is treated as an increment. You can accomplish the task by passing in two copies of the projection vector and then dividing the result by 2. Calculate the inverse Radon transform on a GPU. 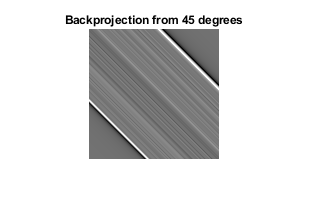 Parallel beam projection data, specified as one of the following. If theta is a scalar, then specify R as a numeric column vector containing the Radon transform for theta degrees. If theta is a vector, then specify R as a 2-D matrix in which each column is the Radon transform for one of the angles in theta. To calculate the inverse Radon transform using a GPU, specify R as a gpuArray that contains a numeric column vector or numeric matrix. Projection angles (in degrees), specified as one of the following. numeric vector Projection angles. There must be equal spacing between the angles. numeric scalar Incremental angle between projections. Projections are taken at angles m*theta, where m = 0,1,2,...,size(R,2)-1. To calculate the inverse Radon transform using a GPU, you optionally can specify theta as a gpuArray that contains a numeric vector or scalar. Type of interpolation to use in the back projection, specified as one of these values, listed in order of increasing accuracy and computational complexity. If you calculate the inverse Radon transform using a GPU, then interp must be 'nearest' or 'linear'. Filter to use for frequency domain filtering, specified as one of these values. Cropped Ram-Lak or ramp filter. The frequency response of this filter is | f |. Because this filter is sensitive to noise in the projections, one of the filters listed below might be preferable. These filters multiply the Ram-Lak filter by a window that de-emphasizes high frequencies. 'None' No filtering. iradon returns unfiltered backprojection data. Scale factor for rescaling the frequency axis, specified as a positive number in the range (0, 1]. If frequency_scaling is less than 1, then the filter is compressed to fit into the frequency range [0,frequency_scaling], in normalized frequencies; all frequencies above frequency_scaling are set to 0. 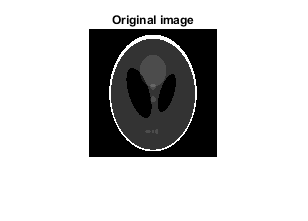 If you specify output_size, then iradon reconstructs a smaller or larger portion of the image but does not change the scaling of the data. If the projections were calculated with the radon function, then the reconstructed image might not be the same size as the original image. Grayscale image, returned as a numeric matrix. If input projection data R is data type single, then I is single; otherwise I is double. If the inverse Radon transform is computed using a GPU, then I is returned as a gpuArray containing a numeric matrix. Frequency response of the filter, returned as a numeric vector. If the inverse Radon transform is computed using a GPU, then I is returned as a gpuArray containing a numeric vector. iradon assumes that the center of rotation is the center point of the projections, which is defined as ceil(size(R,1)/2). 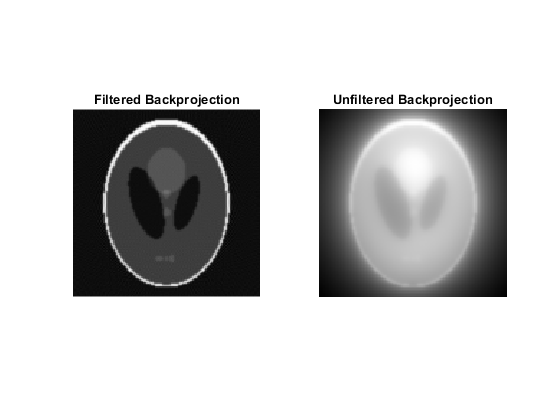 iradon uses the filtered back projection algorithm to perform the inverse Radon transform. The filter is designed directly in the frequency domain and then multiplied by the FFT of the projections. The projections are zero-padded to a power of 2 before filtering to prevent spatial domain aliasing and to speed up the FFT. Kak, A. C., and M. Slaney, Principles of Computerized Tomographic Imaging, New York, NY, IEEE Press, 1988. The GPU implementation of this function supports only nearest-neighbor and linear interpolation methods.